Got this recipe from my mother and make it a lot. Its a real crowd pleaser - there is never any left overs! Peel, de-core and chop the apples. Cook them in a pot on a low heat with 50g of caster sugar and a tablespoon of water for 7 minutes. Transfer the apples to a pie dish - spread out evenly. Top with chopped strawberries and blueberries. Rub flower and butter together with your hands in a large bowl until it looks like breadcrumbs. Then stir in the brown sugar. Scatter this mixture evenly over the fruit in the pie dish. Cook in a preheated 180 degree c oven for 35 minutes. Hey presto and its done - serve with some custard and some cream. Delicious! 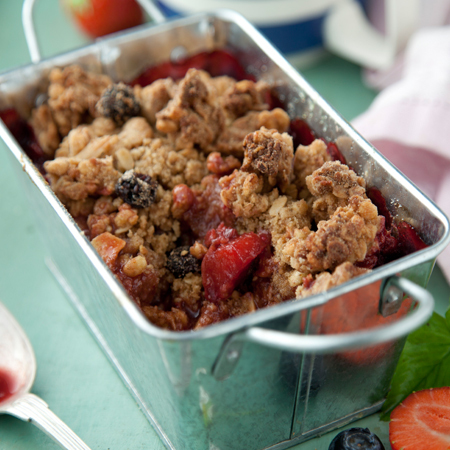 Very straight forward recipe & great for berries that are in season - can't wait to try it!